Chapter 3 – Fun with Air! I am very excited to share my classroom experience with the students of Class IV A. To introduce the topic, I walked into the class with my mouth blown up full. All the children were eager to know what was inside my mouth and asked, “What happened to you?” I smacked my palm against my cheek. All the children laughed and they too did the same. Now, I raised a question, what was in my mouth? I got a loud answer in chorus from the whole class “AIR”! Then, we sang the poem which was given in the Textbook p.23. Next I helped students do the activities related to the many actions of air on different things. Then we got to the activity on bubbles. 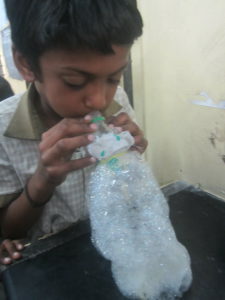 I wanted to make my children experience the wonder that air makes bubbles. I divided them into six groups and gave three glasses to each group. 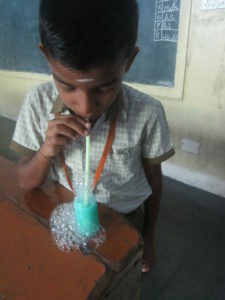 I asked them to fill tap water in first glass and then to blow air through a straw in plain water. 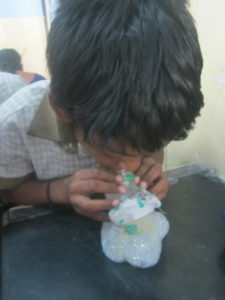 Then I added a spoonful of detergent powder to the tap water and and asked one of the group members to blow. Others observed the bubbles eagerly. The first child blew gently and slowly and got a big bubble. The second child blew hard and got clusters of many small bubbles. Some children got more bubbles when they blew continuously, making a mass of foam that spilt on the floor causing laughter and excitement. Then the same activity was done with shampoo. Students got even more excited and started to compare the bubbles made from plain water, soap water and water with shampoo. They noticed that bubbles from plain water burst almost at once. 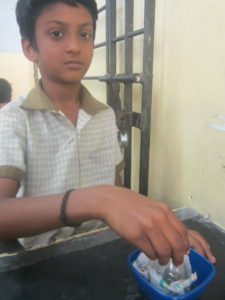 The detergent made many bubbles which stayed longer. The shampoo made the most bubbles, but these bubbles had thinner skins and they burst much quicker than the thicker bubbles from detergent. 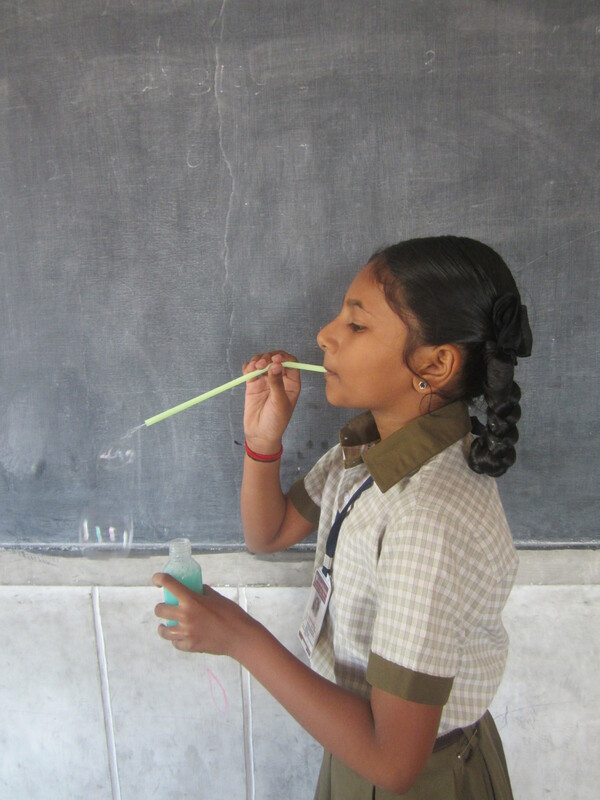 From this experience students made many more interesting observations like, thick bubbles reflect objects, and thin bubbles fly higher! On the internet I found an interesting activity of blowing ‘snake bubbles’. Here’s how we did it. 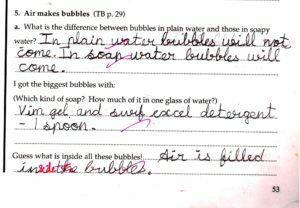 Students guessed that air is present in the bubbles. Then I asked them, how did the air get into the bubbles? This may be the same air that we blew into the liquid! Students later completed Workbook p.53. 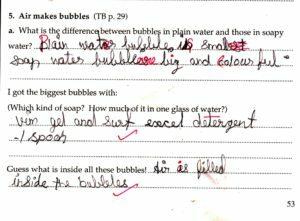 At the end of the class I raised a question, where all can we see bubbles? 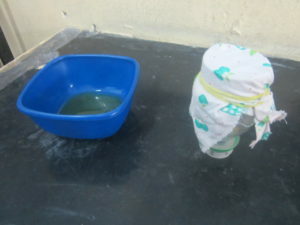 Students came up with many examples like, filling water bottles, rain falling in a puddle, bathing, washing, water flowing from tap into a bucket, inside a syringe, bubble gum, while cooking, etc.. After some more discussion of lather and foam, we came to the end of the lesson.